Each registered person can be linked to a group (or a company department such as "Accounting", "Packaging", "After-sales service", etc. ), to a task that will appear with a distinct color next to the person's name, and to a place. This software can be synchronized with GOOGLE Agenda and includes an Import/Export routine in ICalendar format. With its backup and the possibility of editing between dates at the user's choice, it is a complete tool that will quickly become essential. PLANNING3 can be used as a single workstation or network. New version 3, in addition to the edition between 2 dates, you can also edit the schedule of a person (or a property) or for an entire group! This new version corrects the general ergonomics and provides increased ease of use. PLANNING3 is completely free and freely distributable. For users of version 1 and 2, it is possible to update without losing your data from the outilgestion.fr website. LocaPlanning allows the management of a rental activity (customers, guarantees, deliveries,...) whatever the field of activity. It works on an independent computer as well as in a corporate network with information sharing. Todolist is a utility that requires no installation and allows you to make a list of all the tasks you need to perform. It impresses by its simplicity of use and its very accessible ergonomics. 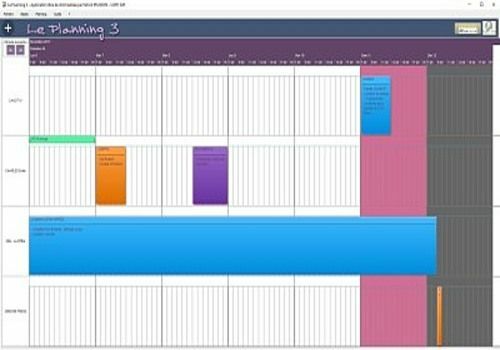 XLS Planning is an Excel-based planning manager that will allow you to effectively manage your staff.